On the back of the inlet is written: This DVD is dedicated to my uncle, Richard Femi Ogunmakin. May he rest in peace. A KEY executive of Velosi, a UK AIM-listed company that recently won a major Shell safety contract, has been shot dead. Richard Ogunmakin, a US citizen who was head of the Nigerian branch, was killed near his home in Lagos. Details surrounding his death are unclear. Velosi’s US manager Kent Morrison said: “Richard was a phenomenal man ? and he will be missed greatly. The news is hitting us very hard.” Velosi inspects oil equipment for safety. Its Nigerian office contributes about $4million a month to group revenues. When assassination replaces wholesome and healthy competition, sign of end time for a nation by Christopher Odetunde, Ph.D. Unfortunately, it was Richard Ogunmakin’s turn to be visited by violence. The full story of how his death occurred in the hands of thugs is till sketchy and one can only speculate because a nation that is incapable of finding the killer of the attorney General of the Federal Republic of Nigeria should not be relied upon to find the assassin who snuffed life out of ordinary citizen, can we? All we can do here is to speculate which Nigerians do well. 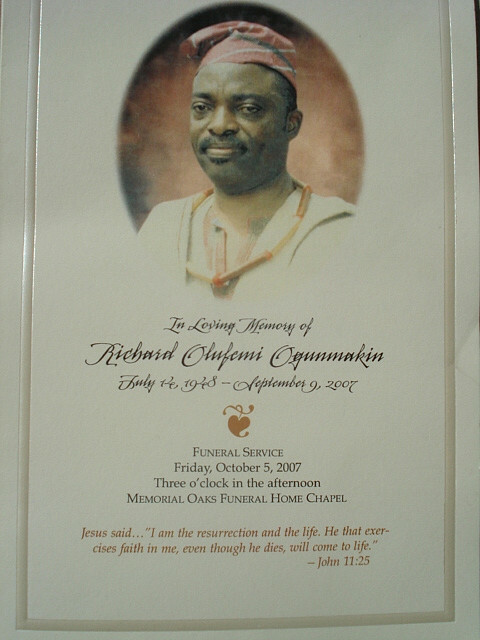 The late Richard Ogunmakin was a businessman. He was lucky to be awarded new contracts. His death may not be unconnected to his rivals or may be due to misunderstanding of issues by business associates. Does death have to settle all disputes in Nigeria? When human beings lack the capacity to reason, deliberate, and resolve issues in an amicable manner, they resolve to violence. The Board of Velosi is also extremely sad to report that Richard Ogunmakin, General Manager of Velosi Nigeria was fatally wounded on Monday 10 September 2007. Richard was a highly talented, successful and generous individual who made many friends throughout the Company. He will be sincerely missed by all his colleagues and the Board together with all the employees of the Company extend their deepest sympathies to Richard's family.